Warwickshire Museum’s collections consist of items either from our county or with a strong local connection. A particular item of interest shown to me from the collection was part of a limestone wall collected in 1969 from Compton Verney, an 18th-century country mansion in Kineton, Warwickshire. At first glance, this piece appeared to be of little scientific interest or relevance but on closer inspection it was clear that it was covered in lichen. Lichens are symbiotic organisms which can form partnerships with algae or bacteria, sometimes even both. The bacteria and algae live among filaments of the fungus, which provides a protected habitat; they in return give the fungi food. Some lichens are considered to be amongst the most primitive living organisms on the earth and are known as “pioneer” or “founder” species. These are species that colonise habitats after a disturbance or extreme event. 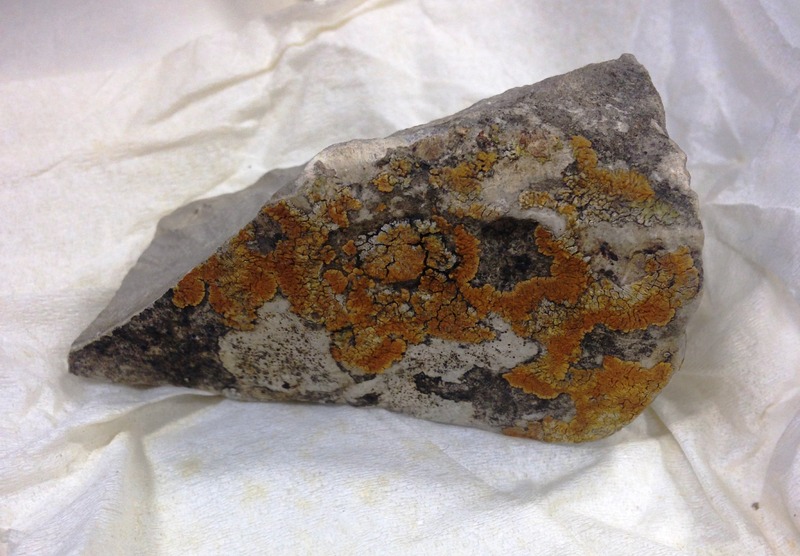 Although it may be unlikely that there was an extreme event at a limestone wall in Compton Verney, bare rock is a harsh environment and it does provide clues as to the conditions that lichens need to grow and that they are hardy and durable organisms. In some parts of the world, lichen is considered a delicacy and in the past Iceland moss (Cetraria islandica) was an important human food in northern Europe, and was cooked as a bread, porridge, pudding, soup, or salad. Historically, lichen was used to generate dyes for clothes.